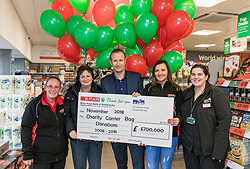 SPAR stores owned by SPAR Scotland wholesaler CJ Lang and Son Limited have donated a staggering £700,000 to local causes, charities, organisations and community groups over the past decade. From 2008 to 2018, company-owned SPAR stores from the Scottish Borders through to Inverness have given generously with donations from 5p SPAR carrier bags in store. Recipients include SPAR’s chosen national charity Marie Curie, who received £100,000. The remaining £600,000 has gone to the NSPCC, Children 1st and local charities and organisations across Scotland – often those that staff have a personal connection to. Colin McLean, CJ Lang and Son Limited CEO said: “I am very proud of the retailers, staff and customers at all our stores for raising such a fantastic amount for good causes since 2008. CJ Lang and Son Limited will celebrate its 100th year during 2019 and to support the anniversary the business is excited to do even more for local charitable causes.